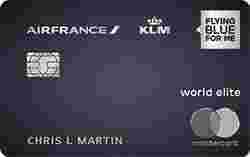 Air France KLM World Elite Mastercard is typically available to those with good credit scores (650 or greater). - 60 XP on account opening, 60% of the way to Silver elite status. The Air France KLM World Elite Mastercard can be a good choice for frequent flyers. It’s particularly helpful if you often fly with SkyTeam airlines, as you’ll earn a strong 3x miles on direct SkyTeam purchases. Also, consider the card if you’re shooting for status in Flying Blue. You’ll need 100 XP to reach Silver, much of which you can earn through the card.